This might be my fav layout ever! Not sure why - love the colours, love the photo, love the memories :). Brown and blue is my favourite colour combo and it's in evidence all over my house, including my craft room. 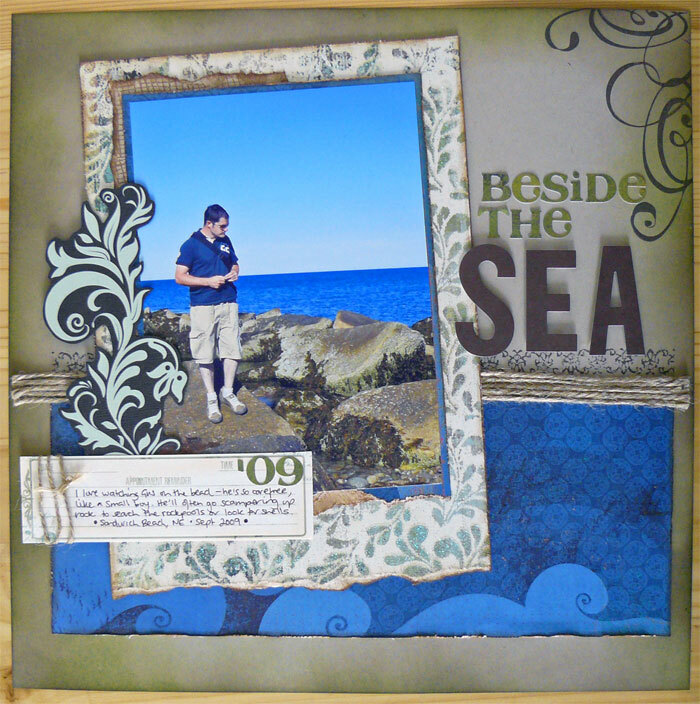 -The swirl at the top and the border across the middle are both stamps - Fancy Pants and Prima. Great LO! very bright, the colours match the pic perfectly! Such a beautiful LO!! Love the way the blue paper looks like a continuation of the sea, and love all the marvelous textural touches. Stunning layout, Katy! You could not have picked better paper to go with your wonderful picture! The blue is so vibrant--love this layout! oh yes those colors are wonderful! Thanks so much for entering my giveaway ,best of luck! Gorgeous layout! the colors are spectacular.